KABUL, Afghanistan — Former Afghan president Hamid Karzai, who still wields considerable influence in today’s Afghanistan despite being out of office for four years, said Thursday he welcomes the entry of five Taliban leaders who were freed from the U.S. military prison at Guantanamo Bay in 2014 into peace negotiations. Karzai, who led the country from 2001-2014, also said he now supports talks between the Taliban and the United States — but only as a step toward direct talks between the insurgents and a negotiating team representing Afghans from across society. He spoke to The Associated Press on the grounds of the presidential palace, where he lives with his young family and meets regularly with tribal leaders, Afghan government officials and foreign notables. Just last week the U.S. ambassador to Afghanistan stopped by Karzai’s office, where Karzai attached several conditions to Washington’s efforts to find a negotiated end to the protracted conflict. They may complicate efforts toward peace talks with Taliban, some analysts say. He also has met with Washington’s new peace envoy Zalmay Khalilzad. Since Khalilzad’s appointment last month, peace efforts have accelerated. The five former Guantanamo Taliban detainees __ some of whom have disturbing pasts and all of whom were close to the hard-line founder of the Taliban movement, Mullah Mohammed Omar __ have come out of the shadows to join the insurgent group’s political office in the Middle Eastern state of Qatar where they will be involved in peace negotiations. They were released in 2014 in exchange for captured U.S. Army Sgt. Bowe Bergdahl. The co-founder of the Taliban movement, Mullah Abdul Ghani Baradar, was released from a Pakistani jail where he had been since his arrest in 2010 in a joint U.S. and Pakistan operation. His release had long been demanded by the Taliban. It came following Khalilzad’s trip to Pakistan last month, his first as a new peace envoy. The choice of Zalmay Khalilzad as a U.S. special envoy to Afghanistan has raised some hackles in the region, with many saying the veteran diplomat’s tough stance on Pakistan could hinder his mission to convince a resurgent Taliban to engage in peace talks. Baradar was reportedly arrested after seeking to start peace talks with Karzai without Pakistan's involvement. In the interview, Karzai accused both the U.S. and Pakistan of foiling talks with Baradar at the time. He also said he made repeated attempts to gain Baradar's release, but his efforts were thwarted by both the U.S. and Pakistan. Karzai's final term in power was marked by a prickly relationship with the United States. He bitterly criticized Washington for steamrolling ahead with development plans, without consulting Afghans, who often found projects unusable or impossible to maintain. He openly fought with the U.S. military over tactics, like night-time raids that infuriated Afghans, secret prisons and the use of drones, saying it strengthened the Taliban and weakened his government. 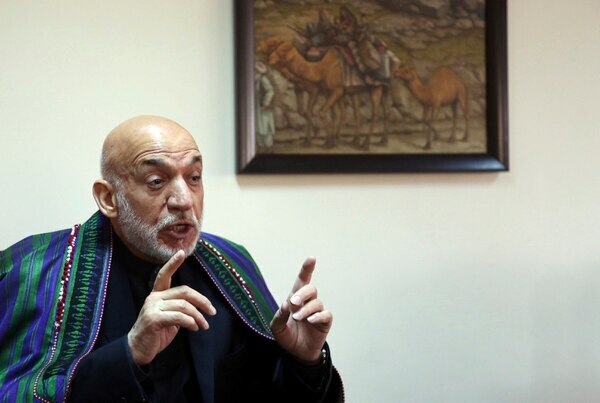 Karzai said he still has reservations about Washington’s intentions as it seeks to find a negotiated exit to 17 years of war, but welcomed Khalilzad in the role of peace maker. Nearly half of troops surveyed worry the U.S. will be drawn into a major conflict in the next year. "I believe he has all the right tools to conduct this if he is given freedom by the U.S. government to act toward peace and peace building in Afghanistan," he said. Karzai has a history with Khalilzad, who was U.S. President George Bush's special envoy to Afghanistan following the 2001 collapse of the Taliban-ruled government. Khalilzad, who later served as the U.S. ambassador, was a strong proponent of Karzai for president of the first post-Taliban government. Still, Karzai told The AP that Afghans are watching this latest peace initiative. An opponent of direct U.S. talks with the Taliban when he was Afghanistan's president, Karzai now sees it as a necessity because the Taliban today control large swaths of the country. In a report released Thursday, Washington's own Special Inspector General on Afghan Reconstruction (SIGAR) said the government has ceded even more territory to insurgents and now controls just over 50 percent of the country. "The Taliban are Afghans and no doubt they control a great part of Afghan territory and that's a fact of life," said Karzai. "Afghanistan and the rest of the world must live with that, therefore a negotiation with them is necessary and good. Let the Americans talk to them." Draped in his traditional green-striped coat, Karzai spelled out the conditions he said he laid out "with clarity" for many U.S. officials who have made a visit to his office, including Khalilzad. Foremost among them is a warning to Washington against making deals with neighbor Pakistan, which most Afghans blame for many of their troubles and whom they accuse of aiding and giving sanctuary to Taliban insurgents. Even as president Karzai loudly accused Washington of being in cahoots with Islamabad to keep Afghanistan destabilized to further their own interests — Washington to keep an eye on its foes Iran, Russia and China and Pakistan to keep Afghanistan as a client state. 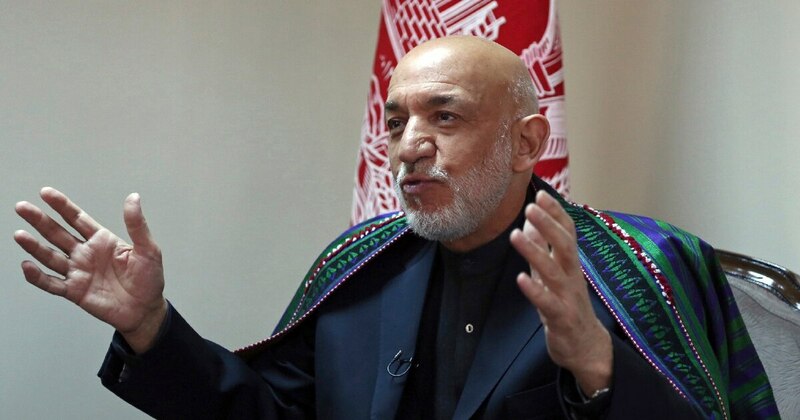 "We will in an extremely forceful way oppose any deals between the U.S. and Pakistan on Afghanistan and Afghan destiny," said Karzai adding that peace negotiations also need to involve regional powers, most notably Russia and China as well as neighbors including Iran. “Afghans just want peace and a sovereign country and they want to be left alone to their own, to make a living and to do better in their lives,” he said.